Calling all yoga mamas to the mat for a very special Align + Wine Yoga! Join Shavonna on the Second Sunday in May in honor of Mothers Day. Bring your mom, sister, friend or any special woman that has Mothered you to enjoy a yoga session to Align the body. After we Align, get ready to Wine with tastings guaranteed to expand your palate and maintain your Zen! Space is limited so grab your tickets today! Registration includes yoga session, wine tastings, and special treat for Mothers. Please bring your own yoga mat, small towel, and wear comfortable clothing. Ready to refresh your yoga practice and taste buds? Join Shavonna at VinoTeca for her signature Align + Wine Yoga class the Firs Sunday in September. Come enjoy a yoga session that will Align your body with postures to decrease stress, build strength, and improve flexibility (mentally and physically). After we Align, get ready to Wine with tastings guaranteed to expand your palate and maintain your Zen! Space is limited so grab your tickets today! Registration includes yoga session and wine tastings. Please bring your own yoga mat, small towel, and wear comfortable clothing. Ready to refresh your yoga practice and taste buds? Join Shavonna the First Sunday of every month* at VinoTeca for her signature Align + Wine Yoga class. Come enjoy a yoga session that will Align your body with postures to decrease stress, build strength, and improve flexibility (mentally and physical). After we Align, get ready to Wine with tastings guaranteed to expand your palate and maintain your Zen. You will also have a free time to enjoy the scenic view via nature trails, walking the labyrinth, and/or relaxing in the outdoor Jacuzzi. Spa and massage appointments are available at an additional price (attendees are responsible for booking and payment). E-mail Shavonna, if you need assistance with rooming assignment at shavonnawarthen@gmail.com. Describe your current yoga practice or experience. Please include any physical limitations that would prevent you from participating in the retreat. All-inclusive retreat package includes: one night accommodation, all yoga, meditation and workshops, 3 healthy meals, a wine tasting with transportation, wine with meals except Sunday breakfast, and use of the jacuzzi, labyrinth and woodland trails. Optional items are the sole responsibility of the retreat participant and include: massage/spa appointments and additional wine or beer. Retreat payments are non-refundable seven days after purchase date. Deposits must be PAID IN FULL by 9.21.2018. Salud! Thank you for completing your Align + Wine Retreat Registration. Ready to refresh your yoga practice and taste buds? Join Shavonna the Second Sunday in July at VinoTeca for her signature Align + Wine Yoga class. Come enjoy a yoga session that will Align your body with postures to decrease stress, build strength, and improve flexibility (mentally and physical). After we Align, get ready to Wine with tastings guaranteed to expand your palate and maintain your Zen. Ready to refresh your yoga practice and taste buds? 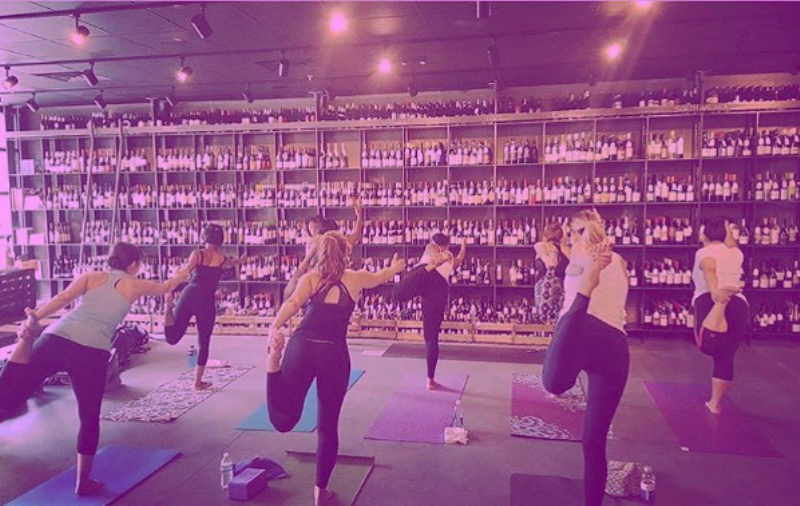 Join Shavonna the Second Sunday in June at VinoTeca for her signature Align + Wine Yoga class. Come enjoy a yoga session that will Align your body with postures to decrease stress, build strength, and improve flexibility (mentally and physical). After we Align, get ready to Wine with tastings guaranteed to expand your palate and maintain your Zen. Ready to refresh your yoga practice and taste buds? Join Shavonna at VinoTeca for her signature Align + Wine Yoga class the Second Sunday in April*. Come enjoy a yoga session that will Align your body with postures to decrease stress, build strength, and improve flexibility (mentally and physically). After we Align, get ready to Wine with tastings guaranteed to expand your palate and maintain your Zen! Space is limited so grab your tickets today! Registration includes yoga session and wine tastings. Please bring your own yoga mat, small towel, and wear comfortable clothing. *In observance of Easter on 04.01.2018, the April Align + Wine session is taking place the Second Sunday on 04.08.2018 instead of the First Sunday. Ready to refresh your yoga practice and taste buds? Join Shavonna the First Sunday of each month at VinoTeca for her signature Align + Wine Yoga class. Come enjoy a yoga session that will Align your body with postures to decrease stress, build strength, and improve flexibility (mentally and physically). After we Align, get ready to Wine with tastings guaranteed to expand your palate and maintain your Zen! Ready to refresh your yoga practice and taste buds? Join Shavonna for a special edition of her signature Align + Wine Yoga class on May 7. We will honor Mothers with a dynamic yoga practice and toast to Mother Earth with wines featuring feminine backgrounds. Come enjoy a yoga session that will Align your body with postures to decrease stress, build strength, and improve flexibility (mentally and physically). After we Align, get ready to Wine with tastings guaranteed to expand your palate and maintain your Zen! Do you love Yoga? Do you love Wine? If so, don't miss this month's special Valentine's Edition of Align + Wine at Vinoteca! Come enjoy a yoga session that will Align your heart with postures to decrease stress, build strength, and improve flexibility (mentally and physically). After we Align, get ready to Wine with tastings guaranteed to expand your palate and maintain your Zen! Ready to refresh your yoga practice and taste buds? Join Shavonna the First Sunday of each month at VinoTeca for her signature Align + Wine Yoga class from 11:00am to 1:30pm. We'll begin with a 75 minutes yoga session including yoga postures to build strength and flexibility along with breathing techniques to decrease stress in the body and mind. After we Align, get ready to Wine! The wine tasting will be led by our hostesses at VinoTeca and will include a few of their favorite wines to maintain your Zen. Space is limited so grab your tickets early by CLICKING HERE. *Registration includes yoga session and wine tasting tickets. Please bring your own yoga mat, towel, bottled water and wear comfortable clothing.